Over the weekend, I made this gorgeous and simple dish. Layered on a bed of soft cheese, summer produce—ripe tomatoes, zucchini and leeks are seasoned with salt and pepper and deliver a taste like summer. As fall does not officially begin until September 22nd, I thought I’d share this dish which lets the true mettle of the ingredients come through with all its delicious summery goodness. The term galette is used in French cuisine to describe a variety of round crusty and sweet cakes. In Québec, French Canada, galette is usually used for pastries like a large cookie. Although normally used for sweets, I use the term galette here to describe a savory tart similar to a french pastry pizza. I hope you love it as much as we do! For the crust: Whisk flour, salt, and sugar in medium bowl. Add butter; with food processor or rub in with fingertips until mixture resembles coarse meal. Add cold water. Work mixture with fingertips until dough comes together in moist clumps, adding more water by the teaspoon if dry. Gather dough into ball. Wrap in plastic; chill until firm, at least 1 hour. Preheat the oven to 350 degrees F. Sauté the leeks in olive oil until softened and lightly browned. Set aside to cool. Place the ball of dough onto a large parchment-lined baking sheet and roll it into a 12 to 14-inch round circle (it does not have to be perfect). Sprinkle the leeks around the middle of the rolled out crust, leaving about a 1 ½ inch border around the edge. Add cheese over top next, then tomato and zucchini. Gently fold edges over toward the middle, on top of the filling. Sprinkle fresh herbs on top and a nice dose of salt and pepper. Bake for 45 minutes to 1 hour, or until the crust is golden brown and the filling is bubbly. Let cool for about 15 minutes, then slide the tart onto a cutting board, cut into slices, serve and enjoy your slice of summer on a plate. Bon Appétit! Martine’s Notes: I used a mix of Fontina and Asiago cheeses. If you’d like you could also sprinkle grated fresh Parmesan on the crust before baking. I did not follow the cornmeal crust recipe provided by Recipe Girl. Instead, I made a simple and classic pâte brisée. Also, there are similar recipes that use puff pastry, goat cheese or add a few other vegetables. Either way, it’s a delicious and nice summer dish. This IS gorgeous! You think if I can’t afford leeks right now (still adjusting to New York City prices! ), onions would be a fine substitute? Thank you! I’m so glad you like it. Sure, in this recipe I think onions would be a fine substitute. As leeks are onion-like in flavor, but milder, you might want to try one onion or one and a half onions for the two leeks. Good luck! Please keep me posted on how it turns out! Feel free to let me know if you have other questions. Thanks for your comment, question and for stopping by. Thank you! I appreciate your comment and your time to visit the site. I will definitely check out your recipes! Thanks again! Pretty hard not to love something so beautiful, Martine! That looks so irresistibly tempting! A little bit like my onion/cherry tomatoes pizza, but yours is definitely prettier and probably even more delicious with the pâte brisée. Thank you so much. I just had a look at your fabulous onion recipes, so creative and beautiful pictures. Your pizza pie looks absolutely beautiful! I’m going to have to try it! Thanks again! Thanks Shanna! 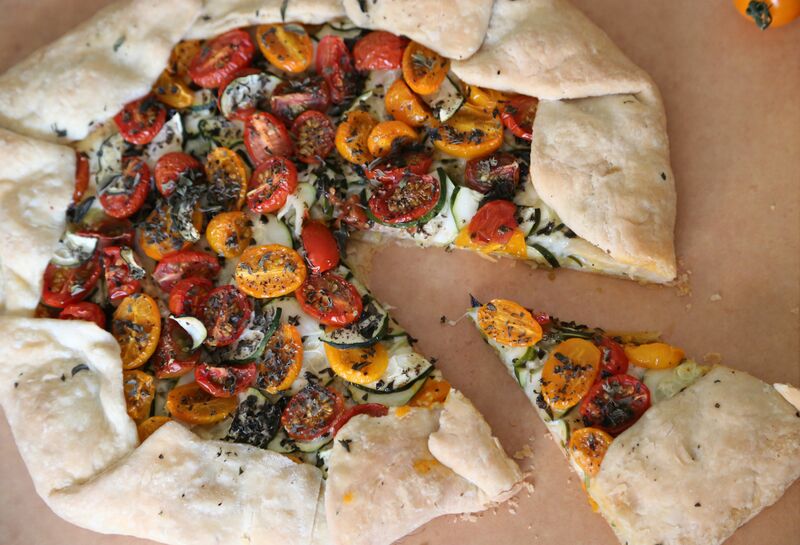 Yes, this is great to make after a trip to a summertime Farmers Market when the tomatoes are bursting with flavor. Yum on your cheese suggestions! You have such an adorable cover. Loved the recipe. Keep up the good work! Thank you Riya. I appreciate your comment. So glad you loved the recipe! Thanks for visiting.